The Wayne County Historical Society will be holding various exhibits, events and fundraisers during the Spring of 2011. In March the first exhibit of the year, “I Love You: 150 Years of Weddings” will open. The preview party is March 10 at 7pm. This event is free and open to the public. Also in March, Executive Director of the Museum, Larry Ann Evans, will be at the Lyons Public Library at 11 am on the 26th signing the most recent publication of the museum, “A Jail Among Us”. In April the Historical Society embarks on a new endeavor with the Lyons Public Library, the Historical Book Club. Members will be reading and discussing three local books about Wayne County History over a three month time period. Interested persons can contact the Museum and talk to Larry Ann Evans or call the Lyons Library, (315) 946 9262 and talk to Teresa Streb to find out the titles of the books and the dates of the meetings. The infamous Lock Up & Jail ‘em, a major fundraiser for the Historical Society will be May 6 at 3:30 this year. If you know someone you would like “locked up” for a good cause, notify the Museum. The Wayne County Historical Society will be holding their annual dinner at the Steger Haus on May 19. Interested parties can call the museum for reservations. Alvin M. Parker, “Hoyendahonh” of the Seneca – Heron Clan will be the guest speaker. Lastly the society will be holding a spring yard sale at the Pure Oil Station (formerly Pacello’s gas station) on Rt. 14 and Canal Street May 20 & 21 from 9am-3pm. Drop off day for gently used items is May 18 from 1pm - 4pm. For more information about these events, call the Museum of Wayne County History at 315-946-4943 or look at the website, www.waynehistory.org. 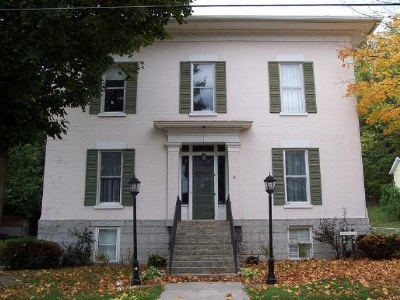 The Museum is located at 21 Butternut Street, Lyons NY. 0 Comments to "WCHS to Hold Varied Events this Spring"